Levon Helm plays drums and mandolin on this 2001 CD. He also guested on Wilson's 2000 album Hillbilly Homeboy. 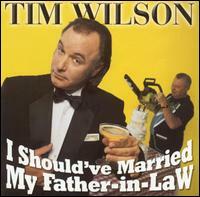 Maybe it's the 2000 presidential election that has energized him, but Tim Wilson is more belligerently right-wing than usual on I Should've Married My Father-In-Law. The sexism and racism in which he generally indulges are present, but they take a back seat to his interest in taking potshots at liberal Democrats here. An aspiring country singer with an abysmal voice, Wilson devotes ten out of 23 tracks and more than half of the album's running time to his satiric songs, among them "Hollywood," which posits that reactionary would-be actors had better become liberals if they're going to make it in the movies (who does he have in mind, himself? ), and "Brady Bill (Gunfighter Without a Gun)," a bone-headed attack on gun control. "You ever notice the people who are against guns are the people that oughta be shot?," he asks in one of the standup segments, and then cites an example, Rosie O'Donnell, speculating about how much firepower would be necessary to take the portly talk-show host down. Though he professes not to be a Republican, the most criticism he can muster for the Grand Old Party is to make fun of South Carolina Senator Strom Thurmond's age. (Thurmond's politics don't bother him, of course.) Wilson laces his remarks with four-letter words, all of which are bleeped out, though it's obvious what he's saying, thus sparing his album a parental advisory sticker and making these tracks ready for morning "zoo" radio play, where they doubtless will get their widest dissemination. But though he frequently succeeds in being offensive, Wilson is only occasionally funny. He seems to think that if you substitute a few words in "Stairway to Heaven" and sing it badly, the result will be hilarious instead of embarrassing. Wrong.